What’s the first thing most people learn about wine pairing? “Red with meat, white with chicken or fish.” But what about when the main dish is roasted veggies or a spicy vegetarian stir-fry? We’ve asked wine pourers and importers, grape growers, and restaurateurs for their wine-pairing recommendations for various types of vegetarian cuisine. Their easy-to-follow advice makes choosing a bottle or two a snap, whether you’re serving an Eastern Mediterranean falafel or a spicy Thai curry. White or red? There’s no wrong answer. 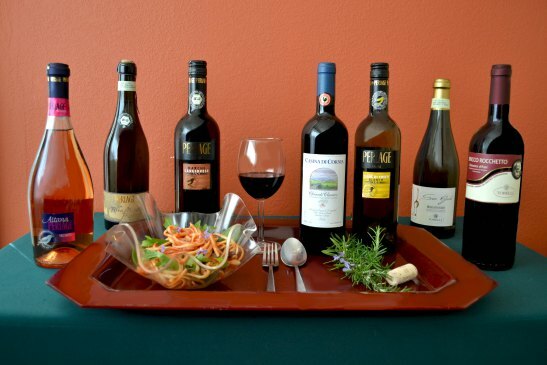 “So many people think you can only drink white wine with tofu or roasted vegetables and red wine with pasta, which is really crazy,” says Gary Vaynerchuk, host of Wine Library TV (winelibrarytv.com). Sweetness, acidity, and robustness are better indicators than old-school wine-pairing rules when choosing a wine to go with food. Sparkling wine with tofu and bean dishes, a dry or full-bodied white wine with pasta—these are just two pairings Vaynerchuk suggests to show how innovative wine pairing can be. “Don’t fear the rose,” adds Jody Brownell, a longtime vegetarian and co-owner of the Wandering Dog Wine Bar in Solvang, Calif. “Great vegetarian food lets the flavor of vegetables come through.” Dry roses made from traditional red wine grapes, such as Pinot Noir and Syrah, are an easy choice because they go well with a variety of vegetarian dishes and don’t overpower the fresh flavors. Think locally (even when you buy globally). “In Europe all the wines and foods grew up together, so look for wines from the same or similar regions as the food you are eating,” recommends Berkeley, Calif., wine importer Kermit Lynch. In other words, an herb-laced Mediterranean ragoût will naturally go well with a hearty wine from Spain, Italy, or southern France, just as a cream- or cheese-based dish (typical of northern European cuisines) is best served with a more delicate wine from a cooler growing region such as Burgundy or Bordeaux. But don’t rule out Californian, South African, Australian, or Argentinean options just because your meal is French or Italian. Wines that come from similar climates can match the food just as well. “Pair great with great, humble with humble,” advises Karen MacNeil, author of The Wine Bible. A weeknight pasta dish probably doesn’t warrant uncorking a pricey Chardonnay. But if the meal is a celebration, bump up your budget to try a finer vintage. A young table wine won’t stand up to a gourmet entree as well as a more complex wine, even if the table wine is from the right region. And it’s harder to appreciate the nuances in an expensive Bordeaux when sipped with a quick supper. “Delicate to delicate, and robust to robust,” MacNeil adds. “A subtle wine will end up tasting like water if you serve it with a dramatically spiced dish, like curry.” MacNeil points out that bold-tasting foods pair perfectly with big-flavored wines. “That’s why various Zinfandels are terrific with many Mexican dishes,” she adds. Sweet tempers heat. Indian and Thai cuisines have no wine-accompaniment heritage, but that doesn’t mean you have to forgo serving wine with your favorite curry or pad thai. The ripe fruit and residual sugars in sweet white wines help tame the heat and bring out the other flavors in spicy dishes. A California Viognier or a German Riesling couldn’t be produced much farther away from Bombay or the River Kwai, but these wine choices will bring out the sweetness of the vegetables in Indian and Asian dishes. Entire books are devoted to wine pairing and selection, so there’s no way we can fit all the info they cover here. The following lists will help you match wines with favorite veg cuisines—and go beyond popular favorites like Merlot and Chardonnay. For a safer bet taste-wise, Raskin recommends choosing organically grown wines or wines made from organic grapes over certified-organic wines. Organic wines are made without sulfites—preservatives that have been used for centuries to protect flavor and extend cellar life. Because certified organic wines don’t contain sulfites, they may not be as shelf-stable. Biodynamic winemakers take the organic ideal one step further by adhering to practices to create a growing environment that “puts energy into the soil in order to put energy into the wine,” says Paul Dolan, a partner at Mendocino Wine Company. Biodynamic growers cultivate vineyards where plants, animals, insects, and vines live symbiotically so that little pest control is needed.